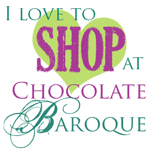 This is my second post in March as guest designer for Chocolate Baroque. I will show you today a spring card with tulips. 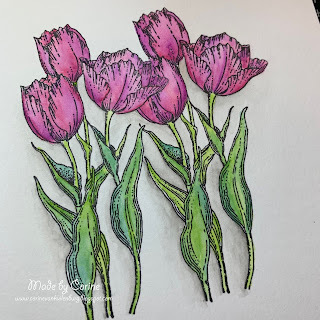 Stamp the tulips on watercolored paper with black water resistant ink. Mask the first print and then place the second print. Color the image. I used watercolorpaint for this. Use Distress Oxide to create a background on watercolor paper with the colors Worn Lipstick and Seedless Preserves. Stamp the fragment with Wilted Violet. With a white gel pen I put dots in the background. Stamp the text with Archival Dusty Concord on a separate piece of paper. 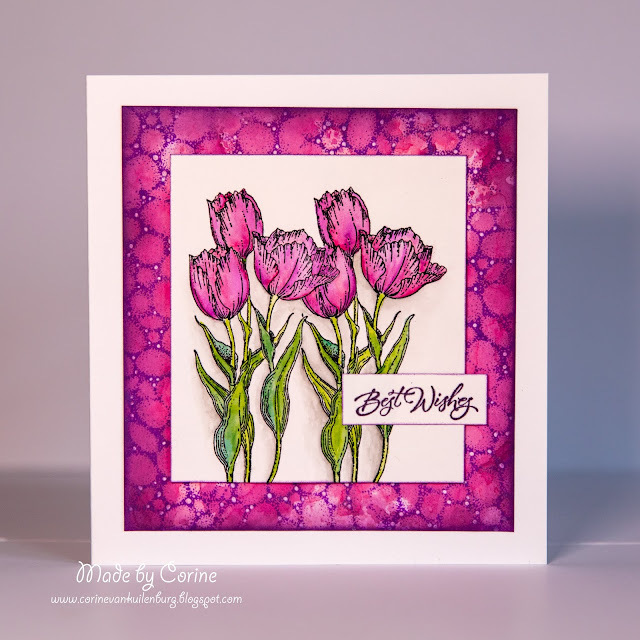 Sponge the edges with Distress Oxide Wilted Violet. Stick the background on a white card. Then stick the 'tulips' with foam tape in the background and attach the text to the right of your card.